Both of the opening games in this series were close, with the second game being even tighter, but as we move on from Moscow, it is the Russian side that holds a 2-0 lead. This means the reigning Euroleague champions are one win away from returning to the Final Four. CSKA Moscow will know that they face a tough challenge in Spain but they’ll fancy their chances of grabbing a win this week, whether it is on Tuesday or Thursday, to finish off the tie. Baskonia know that they are in last chance saloon already but they will receive plenty of backing in their attempt. If the Russian side grabs that all important win, they will be in the Final Four for the 14th time in 15 seasons. This is a remarkable run, and it indicates the consistency of the Russian side over the past decade and a half. With that in mind, it looks like a huge task for Baskonia. 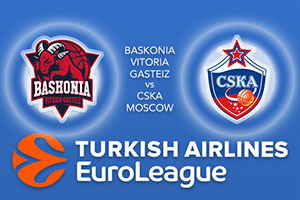 There is also the fact that in the Euroleague Playoffs, no team has managed to bounce back from being 2-0 down to progress, so the Spaniards have to overcome history, and win three games in a row against the powerful Russians, to make their way in the tournament. The second game in the series was clinched with 1.1 seconds left on the clock, with Kyle Hines grabbing the three throws that made the difference. Nando De Colo has been well shackled by the Spaniards, the player offering up an average of 13.5 points and 2 assists, which is way below this season average. Of course, when De Colo labours, Milos Teodosic is on hand to pick up the pace and Teodosic has provided an average of 19 points per game in the series. Cory Higgins has offered an average of 10 points per game. For Baskonia, Rodrigue Beaubois has provided an average of 17 points per game in the Euroleague Playoff series while Shane Larkin has chipped in with 12.5 points per game. The Russians are tipped to see of the series in this game and you can back CSKA Moscow at -1.5 at odds of 1.90. For the Over/Under market, go OVER 165.5 at odds of 1.90. Bet Now!